I was relatively late confirming my start for the Kiwi Hunt. 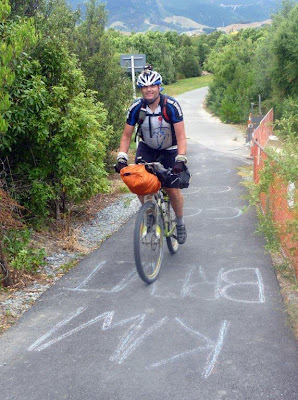 I wasn’t sure how the legs would come back after easing my way into mountain biking, completing the 1100km Kiwi Brevet bikepacking event only two weeks prior. With airfare booked, I confirmed I would be there, but not whether I would be riding or helping out with bag drops. Ultimately my legs came back well with mental tiredness and lack of alertness being more of an issue. Possibly relating to the amount of work I was doing between these two epic events. As crazy the proposition may sound, I often believe that in some situations an employee may be deserving of being paid double-time for time spent on annual leave to account for the additional work that must be completed immediately before and after time away from the office. Randonneuring is relatively unknown in New Zealand, but with eight foreign invaders and myself we had nine starters for the first 1200km randonnee in New Zealand. This made for the most starters I’ve ridden with in New Zealand randonneuring events. My legs were surprisingly strong and I found myself unusually off the front, rather than off the back for most of the first 70km. While technically a false flat, I am fairly certain that this was the flattest 70km I have ridden in my entire life. The mountains were sure to come on this ride. Just not today. Preferring to chew on my food, I was dropped at the first control - the cafe in Hororata (70km/2h45m). The food was too good to disrespect it by inhaling, so I ensured that I chewed at least a few times on the way down. After another 110km of mostly level solo riding I arrived at Geraldine (182km/8h05m) for lunch where I had a chat with Duncan who was driving the van in support of the ride whilst gobbling down half a foot-long Subway, saving the second half for later. With 182km in a fraction over eight hours including cafe stops I was very comfortable with how my time was going at this point. As afternoon became evening, and I had ridden away from the Canterbury Plains and climbed into the more tussocky sub-alpine terrain en-route to Tekapo (270km/13h43m). I seemed to arrive just after closing for most of the local eateries so the second-half of my steak sub came in very handy for dinner. With no moon to light the sky and no artificial light on offer a beautiful night sky overhead lead past Lake Pukaki toward the 3rd control at Omarama (358km/18h30m). I lamented the compulsory helmet laws that made it difficult to see the sky, so with tiredness kicking in and wanting to take advantage of the night sky viewing conditions I had a few short rests on my back looking at the sky along the way. It is no wonder there is a proposal to designate this as a World Heritage Site to establish a reserve for starlight. (See: “Tekapo night sky closer to World Heritage status”). 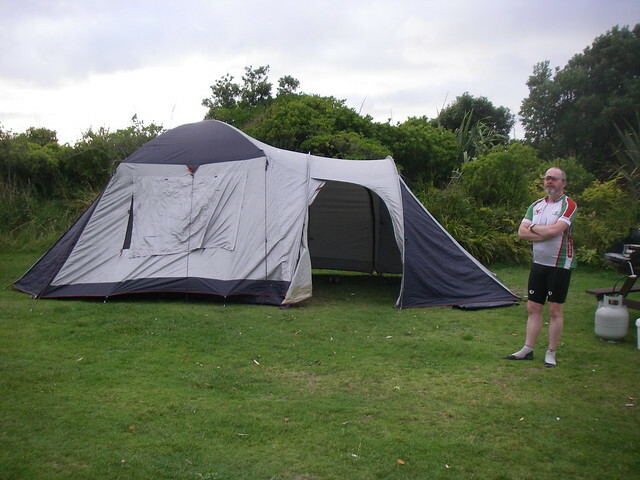 On arrival at Omarama, Duncan and Bruce had setup some tents at the local Top 10 camping ground for us. The tents were easy to find with the assistance of some bicycle tail lights, and a chance for a luxurious five hours sleep for myself. I was narrowly last away from Omarama at about 6:15am, which was slightly surprising as I thought I heard some other riders arrive a some time after me. Perhaps I would pedalling zombies on my travels? Day two began with a 90km ride up the first serious climb over Lindis Pass (971m.asl) before the descent down to Tarras. I briefly passed Paul & Els until I stopped at a stream to top up on beautiful, fresh mountain water. Julian and I spent a bit of time swapping places with each other on the way up the pass. I was quite hungry by the time I arrived at Tarras and enjoyed my brunch at the cafe, which I finished as Julian was arriving on his stainless steel Moulton bling. It was only another 30-odd kilometres into the next control at Wanaka (471km/30h33m), but I was still starving again when I arrived there shortly before Paul and Els were leaving. I was now starting to get near to the time limits but justified to myself on the basis of the amount of time I stationary and eating, with eating being one of the only things in life that is as much fun as riding a bicycle. It was very hot afternoon riding up to and around Lake Hawea. It was only a few more kilometres up the road, well 17km actually and it was time to stop for a frozen dairy dessert. It is amazing how hard it can be to lose weight even when riding 1200km! It seemed surprisingly hilly around lake Hawea, but I think it was more the heat making gentle inclines feel like hard work. I found myself slacking and catching a quick break when ever I could find some shade. Once through to Makarora the views of lakes, and barren sun drenched grass and tussock lands were replaced by native forest on both sides of the road. Has it been a few hours earlier the shade would have been appreciated. This was a section of riding I was particularly looking forward to and I wasn’t certainly wasn’t disappointed. I would happily ride this section of road again. 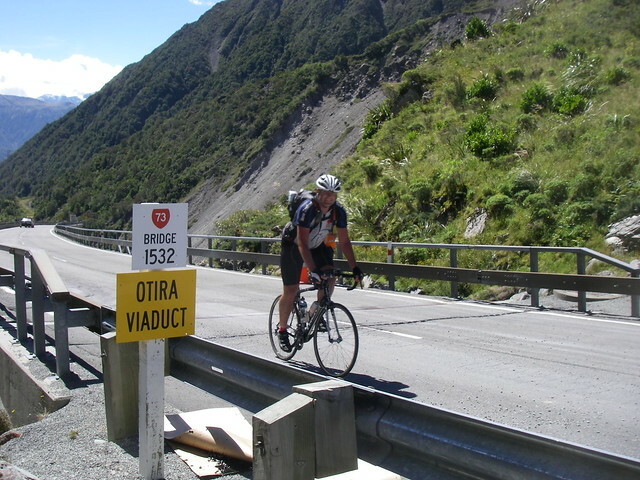 I briefly saw Duncan again somewhere near Haast Pass (564m.asl) as he was driving back to Lake Hawea to camp with Julian who had unfortunately retired from the ride. In the darkness was affecting my alertness as the sleep wombles began attacking. It turned out that the "zombie" even after five hours sleep last night was myself, which was a surprise as I am a natural nightowl. The sleep wombles were soon followed by the tarseal monsters and tree people. Then further along mailbox people as well. Regardless of my slow pace and generous time allocated to both sleeping and eating I I was now in the middle of the full ultra-cycling hallucination experiences which are more common in the RAAM than in randonneuring. Regardless of the five hours the night before, pre-ride sleep deficit cannot be caught up during a 1200km Randonnee. I fought the sleep wombles and hallucinations through to Haast (618km/42h00m) and oh dear, 45 minutes behind schedule. I had a short nap in Haast before heading for the designated overnight location of Lake Paringa. I initially felt a little better after a short nap as I departed for Lake Paringa. Unfortunately the sleep wombles were back, along with their group of friends otherwise known as hallucinations. A more dedicated sleep was going to be required. There would be no point sleeping on my bike and riding off the road, or salmoning into oncoming traffic in the opposite lane. I called into the picnic area at Ship Creek and caught 2 or 3 hours sleep before continuing on toward Lake Paringa. I started well but the sleep wombles returned as I carefully continued in a straight(ish) line hoping for an improvement as the sunrise approached. Improved al that never came. I even stopped to call Duncan to retire for a rare DNF, but with a lack of cell-phone coverage I had no choice but to persevere. I arrived at the former pub at Lake Paringa where we had some mattresses to sleep declaring to Bruce that I was I out and would be withdrawing. I stopped for some soup after which I decided that I was here to ride, so advised Bruce that although I was well behind time and could not possibly finish, I may as well continuing riding the scenic route up the West Coast until Duncan gets back from Lake Hawea. I was riding a lot more strongly after the soup and was making reasonable progress compared to the previous night and earlier in morning. Duncan caught up with me as I hit the hills on the way through to Fox Glacier and loaded me up with Endura, a high magnesium based sports/rehydration drink and I was good to go and set forth for Fox. Thanks Duncan! While I was currently tracking well behind time, we thought it was likely that I would be able to get back under the cut-off time-limit before arriving at Greymouth. Once at Fox I gnawed on a good sized lunch, which unfortunately came a tad too slowly for my liking during an hour long stop.. perhaps the cafe was growing the vegetables for the salad? Now through to Franz Joseph Glacier (760km/57h20m), I was a massive 3h18m behind the cutoff time, but had 11 hours to cover 170km to get back under the time limit. I stopped very briefly for some chocolate milk before pushing on for the relative flat travel through Whatoroa, Harihari and Ross. Ross was notably warm with a distinct burning smell which I asserted must be related to the mining activity in the town. My headlamp batteries were beginning to fade so I was stoked to see Duncan and Bruce again on my way to Hokitika to collect my spare batteries from the van. They had their share of bags to drop around the country side with riders well spread by this point of the ride. I was getting pretty tired on the way into Greymouth, with the final 20 kilometres from Kumara Junction into Greymouth seeming to take an eternity before I arrived at the campsite at 0330 - about the same time Els was leaving for Otira (do you sleep?). It had taken some effort, after having previously “quit” but I was finally back under the cut-off times again - yay. I had a three hour kip before heading off again just after dawn. It was pretty slow start to the day. I had some chaffing irritations to take care of but getting my legs moving on the way to Moana (963km) on this morning was proving to be more of challenge than it should have been. Not even the famed meat-pie and chocolate milk at Moana could seem to resolve it. 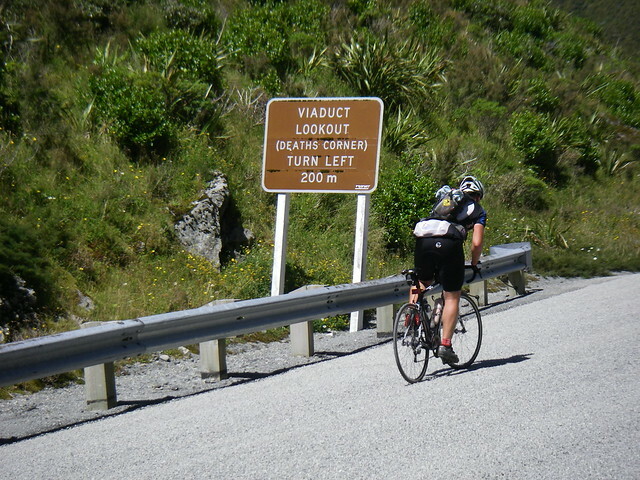 I ambled into Jacksons (995km) for a frozen dairy dessert which placed me good stead climb in front of me, firstly more gently up to Otira, before the more feared Otira Gorge and Viaduct climb with steep pitches over 16%! While this may seem absurdly step on bicycle (or laden truck) I have previously felt vertigo tramping up the nearby Browning Pass where 19th century surveyors proposed a road between Canterbury and the West Coast could be built! I assure you that the climb up the subsequently discovered Arthurs Pass is much more attainable and on this occasion with the use of some brief pauses in the shade to manage body temperature I succeeded without using the two-foot gear. I was quite ecstatic, this been the first time I had pedalled the whole up this little slope. I stopped for a well deserved lunch in Arthurs Pass (1029km) where I chatted to Julian who was back riding his Moulton bling, riding the last 200km or so back Christchurch. I felt I made up for slow morning with the climb up the gorge. But, unfortunately after lunch my progress came to a halt. I should have performed better over this section but for the dual adversaries of a brisk headwind and unbelievably rough gravel (rocks?) chipseal providing no reward for effort over the undulating 60-odd kilometres to Porters Pass. My motivation was waning at this point, and ultimately this is time I should never have lost and likely cost me an official finishing time. Flock Hill seemed to have grown in steepness from what I recalled with my legs spent, I was left without enough gears and a brief section of push-biking as I struggled through the late afternoon before finally making it to Porters Pass (1093km) and finally a nice long descent. Back in Canterbury, I made it to the penultimate control in Oxford (1138km/87h06m) exactly on the time limit. The guy who signed my card had seen Els earlier, I didn’t ask how along ago. Was I close behind, or had he been just at the bar for a long time? I was now pretty exhauated as I ate out some miles through to Rangiora, trying to keep with 25km/h to the finish to make the 1am cutoff in Christchurch (1202km/90h19m). I didn't quite make it, arriving 19 minutes late. Obviously spending more time riding and less time eating, sleeping and resting would make a great deal of difference and while I was a tad disappointed that 90h19m being over 90 hours and thus not an official finish, I felt that in the context of the adversity of exhausted, overdone legs with two massive rides this month - almost making the final cut-off after "quitting" at halfway is still somewhat an “unofficial achievement”. What I do know now, is exactly where my exhaustion and hallucination limits are, which when into future endurance rides well rested will enable me to plan, enjoy and attain some personal records along the way. Thanks for organising it all Duncan, and driving all that way so that we could all ride our bikes and enjoy the air and the scenery.